I started thinking about this today because I’ve been up since 3:30 this morning. There was a wicked wind storm last night, and my cats were freaking out, all kinds of stuff banging around outside. J went outside to check it out, and well, I’ve been up ever since – except for that slight twinge of sleep that finds you just as your alarm clock is going off. So I’ve been up since 3:30. Tired. And I started thinking, ‘Hmmm, this is how moms feel every day.’ And that scared me. 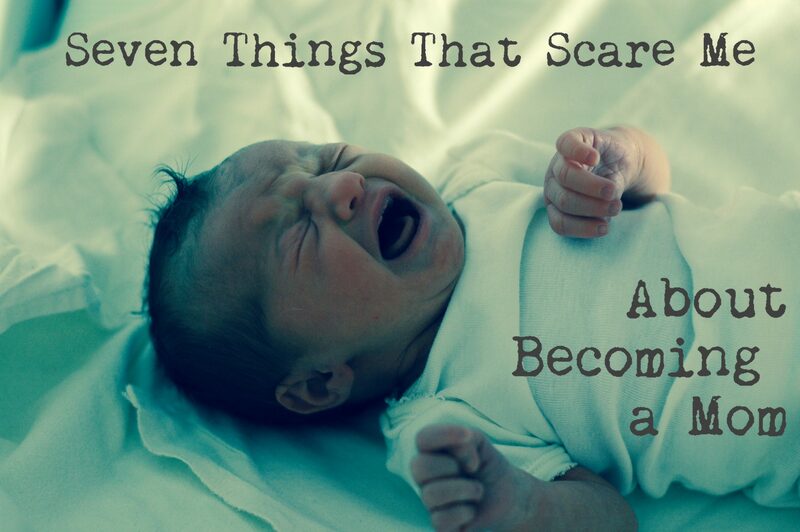 And then I started to think about other things that scare me about becoming a mom. Actually, there are a lot of things. I’m not pregnant yet, but I spend a lot of my time thinking about trying to get pregnant, getting healthier, charting every nuance of my reproductive parts. But I don’t really think a lot about what it will like to actually be a mom. When I do, well, it scares me. I sort of feel like I am so far behind the curve for my age – to just be starting out? It feels overwhelming. I have girls who were my students with babies on each hip. These girls can run circles around me when it comes to adeptness with kids. So, I’ve been making this mental list of things that really give me that panic-y feeling. 1. Not getting enough sleep. I know this is a fact. Moms, especially new moms, are tired all the time. It’s not just that I love my sleep (and I do); it’s that I need my sleep. I seriously hit the wall when I run out of steam. I can’t function. I am afraid I will be miserable (and miserable to be around) if I am sleep-deprived. I know that seems shallow and selfish, but I worry about this. Especially since, unless there is a financial miracle, I will still have to work. Moms – how long does this stage last?? I’m nervous. 2. Paying for child care. In a perfect world, I would be a stay-at-home mom and write. Again, unless God intervenes, I will have to go back to work. We do not live an extravagant lifestyle by any means – we have a small, 2 bedroom house; we drive a Jeep and a Hyundai; most of our vacations are deals we find on Expedia. Even penny-pinching, it is still so expensive to live on Long Island. Many months, it’s paycheck to paycheck. I know God will provide when the time comes, but when I try to budget this, I have no idea how we are going to pay for childcare. Neither of our parents live here anymore, so the grandparents helping out isn’t an option. This frightens me. 4. Doing my job. My job right now is so demanding. Contrary to what people think, teachers don’t have a cush job. We don’t get to go home at the end of the day or on the weekend and leave our work at work. It is always with us. I am always prepping, grading, researching, planning, designing; it’s just what a teacher does if she wants to be good. And I want to be excellent – for my students, for God, for myself. I don’t see how I can do what I am doing and be an excellent mom, too. Something has to give – and I don’t want it to be raising my child. But I fear that I’ll become second-rate at my job- or that I won’t be able to do it at all. Now, things can change…roles, responsibilities…but things as they are today? Yeah, don’t know how that would happen. 5. The impact on our marriage. I’m not overly worried about this one (yet? ), but in being realistic, I know that adding a baby into our otherwise selfish existence could strain things a bit. I’m believing it will make us better and stronger. I’m believing our lives will change for the better. But even good change can be hard and stressful. I’m trusting (hoping, praying) that we’ve worked hard enough to create a good foundation to build on. Nothing like having a baby that forces people to grow up, right? 6. Our baby’s temperament. I’m not naive. I know a baby will not be all coos and smiles. I know that babies cry, they can be tempermental, colicky…they can shriek in a way that makes the hair on your neck stand on end. It can be hard to figure out what has made them so upset and uncomfortable. I get nervous when I think about myself dealing with this. What if I can’t get him to stop crying? What if nothing works? What if my beautiful pride and joy is a disagreeable little thing? Will I have the grace, the patience, the fortitude to deal with this? 7. Not knowing what to do. How will I know what he/she needs? Are the books enough? Will I grow into this role instinctively and will my motherly instincts just appear on demand – or will I be completely inept? I know this will be a huge growing and humbling expeience for me. I don’t like not knowing what I am doing! In my little kingdom in my classroom, I’m comfortable. I know what I’m doing; that feels good. I don’t like feeling inept and clumsy. So much to learn. I don’t mind learning; I’m just scared that my learning curve will negatively impact my child. I’m definitely at the back end of the bell curve. These are my tired thoughts today. Even in my tiredness, I know that my fears do not have God factored into the equation. Really and truly, His involvement changes everything. I know He’ll provide. I know He will help. I know He will give grace, patience, wisdom and everything else we need. But even if all of these fears came true? Our baby would still be worth it. i know these fears well. they have circulated in my brain for at least a decade, as i completed my training and went on to practice. no question that my job put me off feeling ready and willing to have kids. even though our professions should in theory "prepare" us to become mothers, raising kids is trial by fire, but much more rewarding than any other job available. So true. I've been reading a lot of the comments on this, and it has been so helpful! Somehow, it works out. And I am learning (*trying), that worrying is so counter-productive! I don't have to think about these things just yet (hopefully soon, though!) - but I know I just have to believe they will all work out!!! Thank you for reading! These things scared me too. Once this girls were born, then a new set of fears popped up. There will always be something to worry about, but I agree that it's all worth it. I get the privilege of working part time at home while I take care of my two girls. On the days I don't get enough sleep, I try to take a nap. If I can't, a cup of coffee does wonders. As far as marriage, you take as many moments alone as you can. Sometimes ten minutes is better than nothing. As far as what the baby needs, you'll know for the most part. It's a trial and error to find out what works best for you. Thank you SO much for taking the time to write what you did! I truly treasure your wisdom and insight! (I wish we could have coffee, too!!! lol). Thanks for sharing your story and your journey and all God has brought you through. I LOVE, love, love hearing all of that. A huge testimony. God has always proven Himself every time He has asked me to take a step of faith...not sure how things would work out, what would happen...but He walked me through it. I know I can never plan for how to handle all of these issues now - nor do I think God wants me to! (That's just me being neurotic-me). I've seen what you are talking about in how things don't make sense of 'paper' - but somehow God works it out and provides. And I've seen that, by obeying, new opportunities/provision, etc. come in ways that never would have had I NOT obeyed. So, yes...it will be crazy to think how all this will happen. But I do get the sense that something new is coming....not sure what that is, but I'm excited and just waiting for God to open doors and change things up. That's the exciting part of letting Him be in control. I so appreciate your advice on all of this. I am sure that once I am pregnant, I will be coming back to this for another read. Thanks for your friendship, AnnieLaurie. It's become very special to me! Me too! As you said however, even with these concerns, mostly financial, my precious ones will be worth it all. Hit the nail on the head. I'm terrified about delivery and what to do when we get home. But God is provider and he will see is through. My fear often makes me wonder if that is why God has chosen not to give me a baby. Maybe I'm not ready. But how could these other people be? Oh, I am sure I will be an OCD mom at first!!! Waiting so long for a baby to come...I can't even imagine! I'm sure I'll be a little neurotic at first (and hopefully, just at first!). Thanks for sharing your insight and your stories, Staci. It really helps to read that others have felt the same way, and it all worked out just fine!! Thank you, friend! I experience the same fears myself. You are not alone! It's good to know others are a little crazy like me. I keep hearing from moms that, somehow, it all works out. And that is very encouraging to me!!! Thanks so much for reading!! Oh how I remember those feelings...especially when they told me I could actually take her home. (they were actually trusting me to leave the hospital with her?) It was a huge feeling of fear, and OMG, and more. Now that I'm on the other side of raising my family let me assure you it will be ok. The money comes when it is needed some how, the sleep catches up eventually, the job works itself out, the marriage will survive if it is good in the first place (just keep doing date night) and you will know what they want just like you figure out what your cats want. Babies have a way of letting you know. They don't cry without reason and usually it is because they are hungry, wet, sore, hurting, bored, or sick or sleepy. You will get to know which by their little signs. It will be ok, in fact it will be wonderful. Babies truly are a gift and such good entertainment to watch them discover the world. It's worth it. It's hard and exhausting and scary and all of the things you mentioned, but it's worth it. :) Like you, I need sleep to function. And my son was a really bad sleeper. And somehow we made it. I can't even tell you now how we did it. but we did. You don't know what you're capable of until you have no other choice. As for your last point - books are great, blogs are great, baby milestone apps are great - but nothing beats the intuition of an attentive mommy. A lot of parenting isn't about knowing facts, it's about knowing your child. And when you have one, you will. :) Good luck! Stopping by from SITS! As I read your post I was reminded of Psalms 56:3 - “When I am afraid, I will trust in You.” It almost seems too easy, doesn’t it? And I guess that’s because it is simple. It just isn’t necessarily easy. I loved the honesty in your post. Those are fears that hit every new mother-to-be/mother. But isn’t that the beauty in faith? I love the ending of your post. He really will provide. There will always be new fears. But God will always provide. Even when you haven’t slept or your baby is crying or you don’t know what to do. And it is that knowledge, that faith, that will bring you joy despite any fears. Thanks so much, Gabriella, for your beautiful and thoughtful response! I totally agree- it is simple, though now easy - TRUST! I have been reading through 'Jesus Calling' by Sarah Young, and daily, the word is TRUST!!! Once I let this reality sink in...there really is a peace that comes over me. Thank you so much for your comments and the encouragement!!! So sincere. I am grateful. This is perfect! I'm always wondering in my head, "Will I be able to do it all?" (work, ministry, marriage, motherhood...) -- I guess that's the motherhood struggle I've always heard moms talk about. The ability to do it all, and do it all well. Another one for me is being responsible for our child's spiritual upbringing. It's such a major task (THE major task, really)! I wasn't even raised in a Christian home so I can't just copy my parents. Plus, for us, living abroad, we don't even get a lazy cop-out like "hopefully the church/Sunday School will do it," because we are in a house church! That's a lot of pressure for us! These are big fears, right? I know I don't have to worry about it yet, but still...I definitely think of those things! I agree 100% about the spiritual upbringing (trust me, I'll get there on my worry-list!). It's huge...but I am so excited and passionate to do this. I get my chances on some level as a teacher, but I can't wait to do this in a full-on way. I didn't know you were overseas! Where are you (if you feel comfortable saying/can say)? That's a whole other experience and set of challenges! I fear being overwhelmed by having to do it all (and I might have to!) but I know God will help us. If He gives us these babies we long for, He will give us what we need for them! Hugs, friend! I love that even though you admit to these fears, you meet them with a response of trust that God will provide for your family! I love this post and I love the conversation it has sparked. I relate most to your fears about sleep and balancing motherhood with a career. It's true, it's almost impossible to get enough sleep in the beginning. I still feel unrested at two months in, but it is getting better. Trading off shifts with your spouse or getting some naps on the weekends can do a lot to recharge you. As to balancing the career with motherhood? This was a huge fear for me, and I don't think I would have chosen to have a baby had we needed my income. But I think you and fellow commenters are right that God works everything out when the need arises. To comment on your thoughts on reading books, I did a lot of that and sometimes it actually hurt me, because I was trying to fit our situation into someone else's experience. There are things you just can't learn from a book, and that's been hard for me as a self admitted bookworm/Nerd. The last thing I will say is that I often feel inept at this job, but it does get better; and what really helps is when the baby starts smiling at you like Sam has just started to do. That makes up for so many of the feelings of inadequacy. Blessings to you! I can't wait until you get to have this experience yourself. You have a great attitude about trusting God to work it all out. When the time comes, I'm sure he will! And I really agree with the advice to "know your baby." One of the best things I've done is to just pay attention to Sam and his cues...that really helps me figure out what he needs...most of the time! And going by his cues, sometimes the books are wrong! So it's so important to stay present with baby. So glad to have you reading, and I enjoy reading your blogs too when I can!